Your students can learn firsthand about metamorphosis and the different life cycle stages of insects by observing ladybugs at this research center! 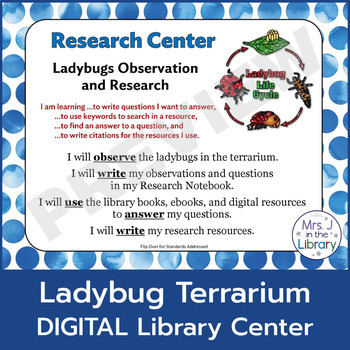 While they are recording their observations of ladybugs in an enclosed terrarium, students will also formulate a question (or two) to answer. Using library resources (print, digital, or online), students will then answer their questions and cite the resources they used. 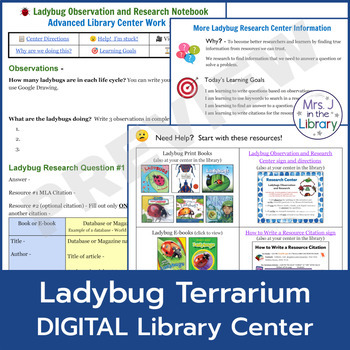 This library center is designed to be used in a school library with students in 2nd, 3rd, 4th, and 5th grades, but it can be used just as easily as a literacy or science center in an elementary classroom. 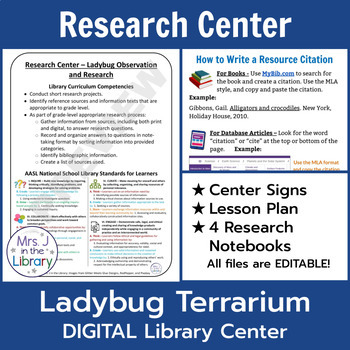 ✏️ Teacher Notes with more resources and information to help you set up and use the library center in a new or existing library centers structure. PLEASE DOWNLOAD THE PREVIEW for full contents, product photos, teacher notes, and the supplies list. 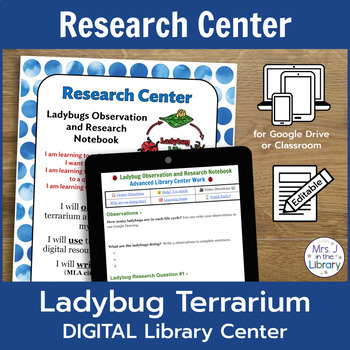 You will need access to books, ebooks, and/or online websites about ladybugs for students to complete their research. I have included ​both print books and online databases in the bibliography / citation section of the Research Notebooks, but ​a collection of reliable websites would also suffice depending on your students’ needs and research skills level. © Mrs. J in the Library - By purchasing this product, you receive a one-user license. Copying or distributing to others is prohibited. Additional licenses for sharing with other educators are available at a discount. For teacher-librarians: You may use this product with all of your classes and students. You can contact me through the Q & A section on TpT with any questions or requests. You can also email me at MrsJintheLibrary@gmail.com.